The Cougar Crazies, a group of enthusiastic—some might say rabid—George School sports fans, first took to the stands of Alumni Gym in 2005-06. And stand they did—often for entire basketball games. They painted their faces. They held banners. They screamed personalized chants for different plays and players. They led the packed gym in the George School hymn during tense moments. 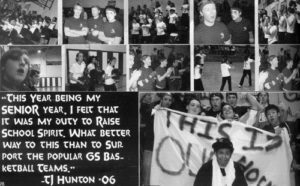 Once the community experienced the positive energy of boys’ basketball, fans and friends began cheering on other teams with similar rowdiness. To this day, it’s not unusual for the sidelines of George School games to be transformed by a Cougar Crazy spirit that sometimes borders on insanity.